”Force11”. At first sight of the website, I had no idea what I’d stumbled upon during one of my online research sessions. The name “Force” took my 25-year old mind wandering to a Star Wars movie setting glowing in the gloom of lightsabers. Combined with the logo of the Force, taking the somewhat shape of an eye, my mind was led to the Eye of Sauron from the Lord of the Rings. What could the theme of this site be? Obviously, I was intrigued. It didn’t take me many seconds of reading before I understood the importance of this website; how it represented a strength, similar to the lightsaber, but with nothing like the evil of Sauron. At this point in time, I was finishing my senior thesis in Sociology, a research project that investigated publication bias and the possible societal structures contributing to its worsening. My interest in the field was awoken during an exchange program at Barnard College in New York, where I consumed many a cup of Starbucks coffee with my friend who was a visiting researcher in physics at the time. He would tell me about his struggles with his research and, knowing nothing about physics, I tried to help him accept the prospect of having to draw a non-significant conclusion. I quickly realized the importance of his prospective results; they had to be significant in order for them to be published in a journal (equaling the chance of a career). 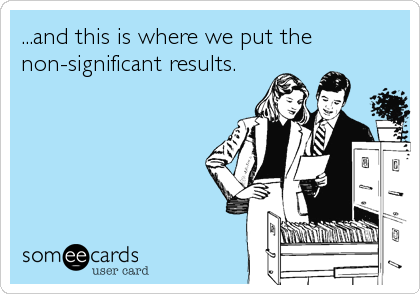 If the results turned out to be non-significant? All the work would be tossed in the file drawer. As the Force2016 presentation by Dr. Erick Turner demonstrated, this is to some extent the way results are treated in our present day scientific community and this fact is not a surprise to many scientists. But to a young Sociology student, I nearly spilled my coffee. “So what about these societal structures?” you might think. Well, they are a tough nut to crack. As the great sociologist of knowledge Robert K. Merton once wrote, “The social stability of science can be ensured only if adequate defences are set up against changes imposed from outside the scientific fraternity itself.”1 The functionalist system of science is affected by market and the economy, the same way the rest of society is, and as Merton writes, the delicacy of science must be cared for. Thus, the market mechanisms could pressure the scientific system too much. This would lead to dysfunctions and to the incompliance to scientific norms, one of these being ‘communalism’; “The substantive findings of science are a product of social collaboration and are assigned to the community"2. Exactly what Force11 is fighting for. The nature of science is in its very essence to be shared and open, and the file drawer is not considered an appropriate repository for openness, if anyone was wondering. My research conclusions pointed to the role of science policies and how these ought to be sensible to the work of the scientific norms; the current budget cuts on research is putting more pressure on scientists, leading to increased competition. It’s not the scientists that are secretive in their nature, rather it’s the economy, and the institutional frameworks ought to be sensible to the scientific enterprise and to strive for balance. My conclusions pointed to the paradoxical situation that more science policies are encouraging Open Access, but it’s my impression that these do not include an effective implementation strategy which will ensure a community norm change. This is to be combined with budget cost on research, even in the paradise of Denmark. Take a little, give a little. And to add on to the paradox – I never got around to publishing my own results. Not even in the university repository. Embarrassing? Yes, certainly so. My unpublished research concluded that the scientific publishing was in a bit of a pickle. A pickle demanding more force than what anyone single-handedly could possess. It would be a task of great global cooperation among political institutions, publishers, universities, and the science community, if this development were to be altered. Before I went to the Force2016, I thought the political institutions would have to lead the battle. But almost 200 years ago, another European citizen went to the US and was inspired. The French political thinker Alexis de Toqueville wrote in 1835 after his travels to America: “Wherever, at the head of some new undertaking, you see the Government in France, or a man of rank in England, in the United States you will be sure to find an association. "3 Toqueville’s statement resembles my slight sceptism before travelling to Portland last month. The Force11 is a bottom-up approach to a complex issue, an approach less used in Europe than in the US, as Toqueville observed in the 19th century. In Denmark, we’d call for the politicians’ attention on any issue, before changing behavior. Maybe it is the high taxes and the relatively large role of the government in our nation that make us lean back while the people in power on the speaker’s tableau decide on changes. At Force11, we don’t lean back. I got a strong sense that the scientists present at the conference were tired of waiting around. We have a world full of people who can benefit from the important science that is produced, as these words are written, all around the world. If the people in power won’t do it, “we’ll just do it ourselves”. During the conference my skepticism of the community approach vanished, I was excited to see the Force11 community build, unfold, and gather in a unique atmosphere, where so many efforts were made to solve this pickle. The pickle I’d, while still in Copenhagen, perceived as being close to unsolvable. I am honored to have been a Travel Fellow with Force2016 and I look forward to continuing to take part in the journey. Let’s keep swinging that lightsaber. 1Merton, R. K. (1968). Social Theory and Social Structure. New York: The Free Pr. : p. 596. 2Merton, R. K. (1968). Social Theory and Social Structure. New York: The Free Pr. : p. 610. 3Tocqueville, A. D. (1952). Public Associations. In H. S. Commager (Ed.) & H. Reeve (Trans. ), Democracy in America (pp. 376-391). London: Oxford University Press: p. 376.